Luxury detached bungalow with private pool with wireless internet. Suitable for 7 people. Beautiful panorama. 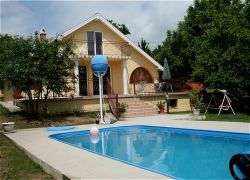 Centrally located between Budapest and Lake Balaton. This is the back side of the Zonnehuis, overlooking the pool. The pool is 7 x 3.5 meters and 1.2 meters deep. Ideal for children. Sukoró is a village of about 1000 inhabitants, attractively situated in a hilly landscape, with the Lake Velence on the south side and on the north Velence hills. With names like Meleg Hegy (warm mountain), Uj hegy (new mountain) and ördög hegy (Devil's Mountain). Great for a quiet and relaxing holiday in clean air with enough activities in the immediate vicinity. Geographically located between Budapest (50km) and Lake Balaton (50 km) close to the M7 motorway. The Zonnehuis located on the outskirts of the village Sukoró, on the border with Velence. On a quiet street, down a hill and surrounded by some residential houses. Distance to the old village center is approximately 1.5 km meters and the distance to the lake about 1.5 km. From the first floor a beautiful panorama of the lake. Sukoró is adjacent to the village of Velence, where you can enjoy swimming, fishing, waterskiing on a cable track etc. There is also a spa with healing thermal bath. There is horse riding and you can rent bikes for a nice route around the lake. 15 km away is the nearest large town of Szekesfehervar. In addition to historic buildings you will find here virtually every major supermarkets for your groceries. Restaurants are many. Both in the village Sukoró and in the immediate vicinity.